MSNBC and CNN collectively gave nearly 5 hours more coverage to a Republican’s arrest and indictment Wednesday than they gave to then-Rep. Chaka Fattah (D., Penn.) after he was indicted by the Department of Justice on similar charges, a Washington Free Beacon analysis shows. 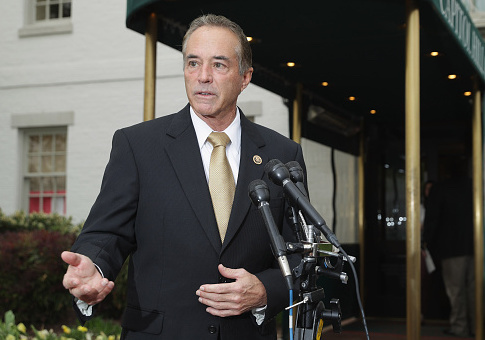 The two networks spent over five hours combined covering Rep. Chris Collins’ (R., N.Y.) FBI arrest and indictment for securities fraud Wednesday. That is 17 times as much coverage as the 19 minutes of combined coverage they gave to Fattah for his indictment by the Department of Justice for charges of fraud, bribery, and money laundering in 2015. News broke Wednesday morning that Collins had been arrested and was being indicted for securities fraud. In addition to the indictment, Collins’ son and the father of his son’s fiancée were indicted on charges related to insider trading. Collins’ indictment was related to the Australian biotechnology company, Innate Immunotherapeutics, a company in which he served on the board of directors. In response to Collins’ arrest and indictment, CNN and MSNBC heavily covered developments throughout the day from the 9 a.m. hour through the 11 p.m. hour. A Free Beacon analysis calculated that CNN spent 2 hours and 33 minutes talking about Collins compared to MSNBC’s 2 hours and 56 minutes covering him. The calculations do not include Collins’ press conference or U.S. attorney for the Southern District of New York Geoffrey Berman’s press conference, which were both shown on MSNBC and CNN. Collins, who was removed from the House Committee on Energy and Commerce by Speaker of the House Paul Ryan (R., Wis.), said Wednesday that he would “mount a vigorous defense” to clear his name and that he would remain on the ballot in November. Fattah was charged in a 29-count indictment by the Justice Department on the morning of July 29, 2015 for his alleged role in a vast criminal conspiracy that includes charges of fraud, bribery, and money laundering. Authorities at the time accused him of accepting an illegal $1 million loan for his unsuccessful run for mayor of Philadelphia in 2007. They went on to say that after his campaign, he organized a scheme to repay the donor of the $1 million loan through fraudulent grants made from his nonprofit, the Educational Advancement Alliance, and various shell companies. CNN spent 5 minutes and 17 seconds covering the breaking news of Fattah’s indictment compared to MSNBC’s 13 minutes and 48 seconds of coverage. Fattah would go on to be sentenced to ten years in prison on federal corruption charges, including fraud, racketeering, and money laundering after being convicted on 23 charges. The 3rd U.S. Circuit Court of Appeals ruled Thursday that Fattah and an associate are eligible for a retrial on the bribery convictions that it threw out. Another convicted Democrat that MSNBC and CNN failed to cover was former Rep. Corrine Brown (D., Fla.), who was sentenced to five years in prison back in December for her conviction in a federal fraud case involving a charity she used to enrich herself. Brown was convicted last May on seven counts of wire fraud, five counts of mail fraud, one count of scheme to conceal material facts, three tax fraud charges, and one count of obstructing IRS laws. Neither MSNBC or CNN covered the breaking news of Brown’s indictment on July 8, 2016 amid coverage of the ambush on police officers in Dallas a night earlier. The post GOP Rep’s Fraud Arrest Gets 17 Times More Coverage Than Democrat Indicted on Racketeering, Conspiracy appeared first on Washington Free Beacon.